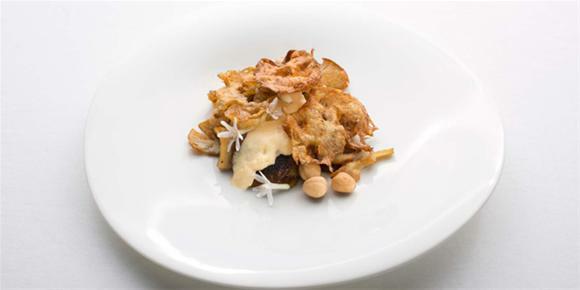 Celebrity chef Peter Gilmore shares an elegant vegetarian entrée that celebrates winter’s bounty of mushrooms, Jerusalem artichokes and hazelnuts – perfect for entertaining. 1. Wash the Jerusalem artichokes well but do not peel. Place them on a rack in a steamer oven for 45 minutes. Remove from the steamer oven and allow to cool. Cut the artichokes in half lengthways and scoop out the flesh with a spoon keeping the skin intact as much as possible. Allow the skins to dry on a cake rack. Reserve the Jerusalem artichoke flesh for another use. Deep fry the Jerusalem artichoke skins in pure olive oil at 160C. Do this in small batches until the skins are golden brown. Drain on absorbent paper and allow to cool completely. Store in an air tight container until needed. 2. Grate the aged gouda. Bring the 400 mls of milk close to boiling point – 90C. Add the gouda, garlic and eschallot and stir well through the heated milk. Allow the cheese, garlic and eschallot to infuse into the milk for 30 minutes off the heat. Strain the milk through a sieve into a bowl and discard the solids. Add 6 gms of salt or to your taste. Mix the whole egg and yolks together in a separate bowl and slowly whisk on the milk mixture. Place the mixture into 8 x 50 ml ceramic ramekins, wrap each ramekin with cling film and put aside. 3. Roast 10 gms of cumin seeds in a dry frypan until golden. Place them in a mortar and pestle and grind. Add the ground cumin seeds to 150 mls of ghee or clarified butter. 4. Warm in a small saucepan and allow the butter to infuse off the heat for 30 minutes. Pour the butter through coffee filter paper and discard the solids. 5. Remove all the stalks from the mushrooms. 6. Place the gouda custards in a steam oven set at 96C and steam for 8 minutes. Meanwhile sauté the mushrooms in the cumin infused butter until light golden brown in colour. Drain the mushrooms on absorbent kitchen paper and season with salt. Remove the custards from the steam oven and remove the cling film. Using a round soup spoon scoop the custard from the ramekin onto the centre of each serving plate. Randomly scatter the sautéed mushrooms over and around each custard. Scatter with a small handful of roasted hazelnuts and garnish with Jerusalem artichoke chips – Serve. What’s your favourite winter entertaining recipe?